Some people apparently use it like this. And then wonder why it slips out. To use the fitbit for sleep tracking, you slip it into the wristband that comes with it. In this picture (which I snagged from the engadget review) you can see the band and the fitbit. Do not wear it this way. It may look pretty and snazzy like this, but the fitbit will slip right outta there. (Enough reviews complain about this problem that it’s worth noting). 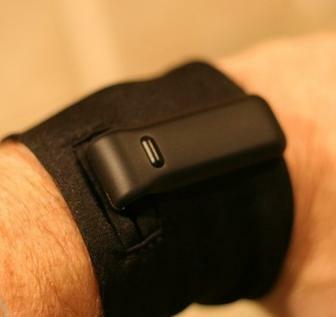 Do the smart thing, slip the fitbit all the way inside the band. You won’t be able to see it anymore, but it won’t slip out. You wear the band on your non-dominant hand. I don’t know why they specify the non-dominant hand, but I’m willing to accept that there’s a reason for it. When you’re ready to sleep, press down on the button for several seconds until the word Start pops up. Do the same thing in the morning until the word Stop pops up. If you forget, it’s okay. You can add in sleep times manually on the website, too. 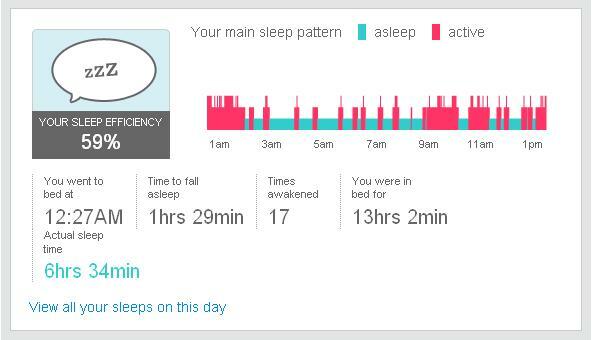 So far as I’m concerned, the sleep tracking is the most useful function of the fitbit. On its own, the fitbit cannot give you conclusive information about your sleep. It can’t tell you if you have DSPS, or Sleep Apnea, or Restless Leg Syndrome. But it can tell you if your sleep is disturbed, which could indicate any of those conditions. Or could indicate that your cat likes jumping on your stomach at 2 am with claws extended. This is what a good night looks like for me. Each pink spike in the graph above indicates a time when I moved around while trying to sleep. It doesn’t necessarily mean that I fully woke up each time, just that my sleep was light enough, or disturbed enough, at that point that I moved. At a sleep lab they’d call that an arousal (which is nowhere near as fun as what I usually mean when I use that word). When you’re in a deeper sleep phase, you don’t move around much. This particular graph is from last Wednesday and indicates a very good night for me. I had 17 brief arousals, and managed to get over eight hours of sleep. I also was asleep at a decent time, which is an issue for me (remember my prior post about charting sleep?). And here’s a bad night. You can see that I was a lot more restless that night (Sunday). I still woke up 17 times. But I stayed awake, or aroused, a lot longer. And as I said earlier, not aroused in the good way. I totalled six and half hours of sleep, although I was in bed for 13 hours. This is incredibly useful information; I wish to heck I’d had this info when I was a teenager getting nagged for sleeping in so late on weekends and being zoned out in morning classes (8am Italian was excruciating). If I’d known how bad my sleep was, I might have been able to do something about it. Or my father (the pediatrician) might have. You see, I have sleep apnea. Want to know what the difference between those two nights is? The good night, I used my CPAP. 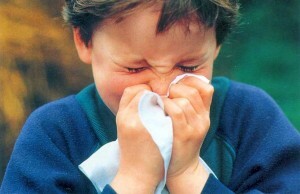 The bad night, because of congestion, I didn’t use my CPAP. See what I mean about that sleep tracking being useful? On its own, the fitbit doesn’t tell me I have sleep apnea. But it does tell me when I’m having trouble sleeping. And these results are consistent enough for me to say that my CPAP definitely makes a difference. Hours of sleep in March. Here you can see how much sleep I actually got this month. Not how much time I spent in bed trying to sleep, but how much sleep. This is a key distinction. You can also see how frequently I wake up during the night. There’s a huge variation there. Some of that correlates with how long I spent in bed (if you’re only in bed for four hours, you’re going to wake up fewer times than you would in eight). But there are other potential factors as well. This data can help me figure out if the nights I take a decongestant are, overall, better. Or worse. Or no different from other nights. Likewise with taking Ambien. Or with exercising before bed. Or having a glass of wine before bed. Or changing my diet. Or any other variable I care to examine.